Note: Click on graphic for higher-resolution copy. LANGLEY AIR FORCE BASE, Va. (ACCNS) -- A graphic artist here designed the artwork that soon will decorate Air Force aircraft everywhere to honor the victims of the Sept. 11 terrorist attacks. Air Combat Command’s Multimedia Center was given the job of designing a special piece of aircraft nose art, explained Jay Welsh, ACC’s chief of visual communication. Welsh challenged his staff to come up with a series of designs that would capture the spirit of the country on Sept. 11. Seven or eight designs were submitted. “They were all terrific,” Welsh said. “We narrowed it down to four selections and then sent them up to Gen. (John) Jumper,” chief of staff of the Air Force. The chief of staff selected the design of Senior Airman Duane White. 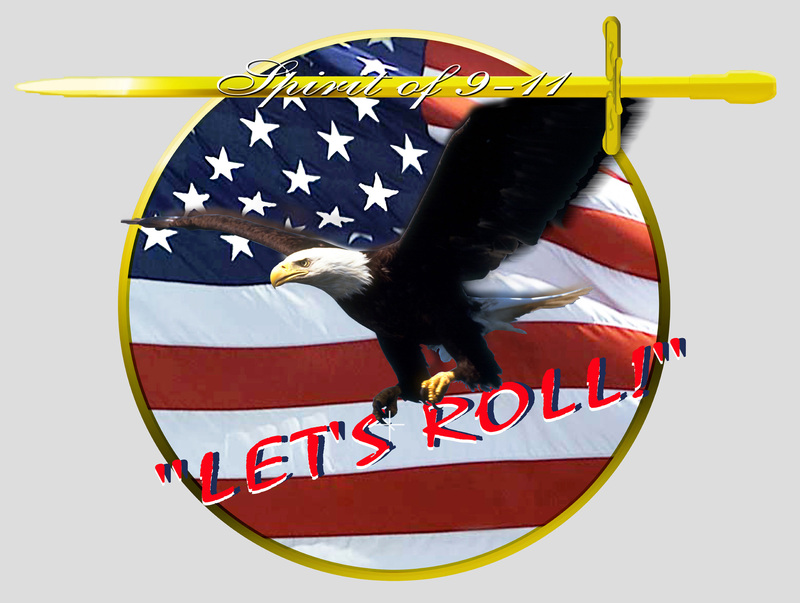 His design has the words “Let’s Roll!” on the bottom and “Spirit of 9-11” on the top with an American bald eagle and U.S. flag. White’s co﷓workers informed him his design would be on aircraft around the world. “I feel honored to be able to pay my respects to those who lost their lives Sept. 11, by contributing a graphic that symbolizes American’s courage in the worst of times,” White said. Welsh wasn’t surprised White’s design was picked. The Thunderbirds and other Air Force demonstration teams will apply this nose art on all their aircraft. Major commands and wings are authorized to apply the design to one aircraft. The words used in the design were made famous by Todd Beamer, a passenger on Flight 93, the flight that crashed in a field in western Pennsylvania. He was overheard on a cellular phone reciting the Lord’s Prayer and saying “Let’s roll!” as passengers charged the terrorists.